The 8th arrondissement of Paris is home to the Champs-Élysées, which ends up at the Arc de Triomphe. The executive branch of French government is also based here, as well as the embassies of certain nations such as the U.S. and the U.K. The French President also lives here, in the Élysée Palace. Take Line 1 to George V.
For many visitors one of the must-see places in Paris is the Avenue des Champs-Élysées which was first created in 1667 by Louis XIV's gardener, Andre Le Nôtre, in order to improve the view from the Tuileries garden. This elegant and broad avenue was extended towards the end of the 18th century, now running from the place de la Concorde to the Arc de Triomphe. 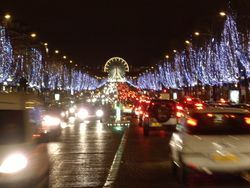 It is noted today as one of the most prestigious shopping boulevards of Paris. At the east end of the Champs-Élysées is Place de la Concorde, the largest square in Paris with fantastic vistas in every direction. It was in this square (then called la Place de la Revolution) that the French King Louis XVI, Marie Antoinette and many others were guillotined during the Terror. The large Egyptian obelisk in the centre of the Place de la Concorde was brought from the Temple of Luxor. 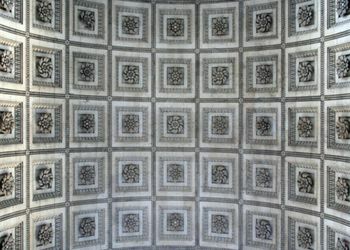 l'Arc de Triomphe, place Charles de Gaulle (Métro Charles de Gaulle-Etoile), ☎ +33 1 01 11 01 03. Le Lido, 116 bis Avenue des Champs-Élysées 75008 Paris (Métro: Georges V), ☎ +33 (0)1 40 76 56 10 ([email protected]), . Office is open from 9 a.m to 8.30 p.m and shop and cabaret are open from 7 p.m until 2 a.m. Kids welcomed from 4. Prohibit filming, taking pictures or recording the show. Dress required (no shorts, Bermuda shorts, flip-flops, outfits and sports shoes). Cloakroom free. 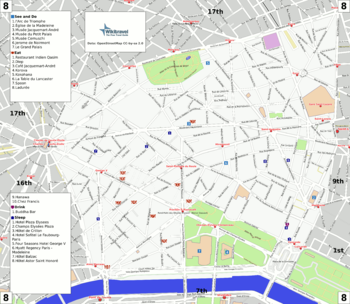 Hotel Ceramic Elysees 34 Avenue de Wagram, 75008 Paris ☎ phone +33 (0)1 42 27 20 30 Great central location. This page was last edited on 30 November 2018, at 10:21.